The quote titling and triggering this post began with a Facebook reader asking me about the meaning behind the quote. I replied that it came from a discussion Oprah Winfrey was having in a televised interview with Jane Fonda as she shared reflections on 'life, love and working out." I further explained that often times people spend their lives striving for perfection, which in and of itself is not bad, however, when striving to be perfect becomes all consuming, it can also be like a poison negatively impacting your life. This is why Islam teaches that there is moderation in everything. (smile) To strive to be whole is to accept yourself, and all of your imperfections and idiosyncrasies; to let go of pain and to forgive so you can move forward, freeing yourself to evolve - to move toward becoming whole. Jane Fonda has, to say the least, led a very public life. In the interview with Oprah she discussed the first two chapters of her life and her memoirs, "Jane Fonda: My Life So Far" (published in 2005). She is now writing another book about the 'third' chapter of her life. Masha'Allah, she will be 73 in December! Seeing her and listening to the interview gave me renewed hope that, at 49, I am far, insha'Allah, from being dead! She also helped me feel reassured that it's not too late yet to find true joy and happiness in a relationship...something I have found myself in despair of never achieving. I can just imagine someone reading this and wanting to write saying, "Astifurgallah al-Azeem - why do you look to Jane Fonda in that way? She isn't Muslim!" To which I reply, you do not have to be a Muslim to be a human being; or to have wisdom to share. To further preempt those who might feel the itch to shoot me down for finding myself lost in thought over a televised interview featuring a non-Muslim woman, what people often forget or refuse to accommodate for when mistakenly jumping to judge reverts is that, that is exactly what we are; reverts. I was raised in a different faith and culture for 42-years. I lived an entirely different life apart from what the average Muslim woman born into a Muslim family and raised in a completely different culture has lived. No one can erase that! And those who refuse to accommodate for the fact that reverts, like myself, have had a lifetime of experience(s) pre-Islam, are being far too short-sighted and judgmental. So, if I, as a revert of merely eight years, find myself identifying with a woman who has lived a life in the same culture I lived in - it is simply what it is! Therefore, if anyone reading this pauses for a even a nano-second to allow judgment to form in their mind over me, my life or comments about my life - please pause again and stop yourself, insha'Allah. In the interview Jane elaborated further on the how a woman's life is divided into chapters. When she spoke of menopause and how difficult this stage of life is - tears came to my eyes. The past two years of my life have been extremely difficult. As I continued listening to and watching the interview, my ears and eyes absorbed everything. In front of me I observed a woman not unlike myself, feeling so much that often tears threatened to breach the brim of her eyelids; she brushed them back several times with the elegant stroke of an index finger. In speaking about her first grandchild she described how her relationship with him opened her heart in a way she never imagined. She described how she used to just get lost looking into her grandson's eyes, and how before he would fall asleep she would lay with him curled up beside her. She said, "I'd turn to go to sleep, but he'd pull me back and say, 'I'm not ready.' And he'd look at me more and say, 'I wuv you, Gamma.'" Subhan'Allah. It made me so grateful to be able to remember similar moments; it was surreal. 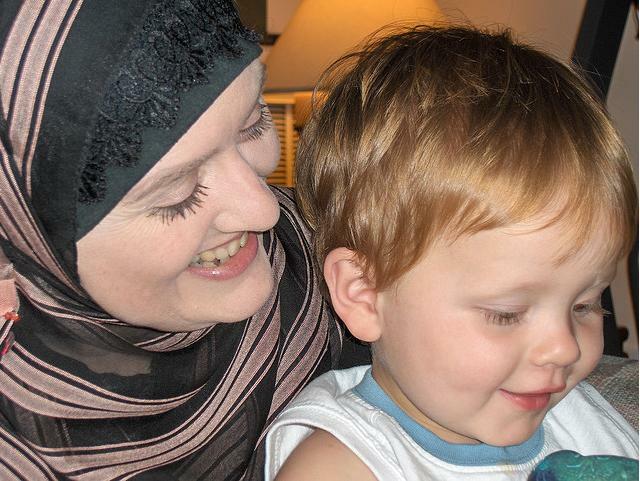 Aishah Schwartz and her grandson, Landen. 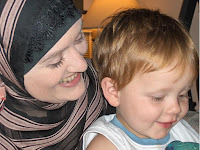 I have a photo, Al-hamdulillah, of myself and my grandson Landen when he was three years old, taken during a visit with family shortly before a trip abroad. It was morning; he had awakened and hearing him call out, I went upstairs to get him because my daughter had spent the night away. Still half asleep when I reached for him, he wrapped himself in my embrace, melting into my body and I carried him downstairs to the sitting room. From the comfort of a chair and the cradle of my arms, Landen fell easily back into a semi-slumber; the warmth of his body, the smell of his hair and skin quickly consuming me. I sat for the longest time just looking down on his angelic face...and my sister picked up her camera to snap the 'Kodak' moment. When I saw the photo...masha'Allah...it was amazing...but even if I didn't have the photo, I will never, ever, insha'Allah, forget holding him in my arms and remembering the gift of motherhood. Later into Jane's interview Oprah reminded her of a quote from their first interview ten years ago for O Magazine: "To do life right you have to feel like you're growing up until the day you die..." It made me smile; so many times I've found myself asking, "Aishah, what DO you want to be when you grow up?!?!" But what I do know is that I need to remind myself sometimes that it isn't such a bad idea to go back and read some of the inspirational stories I've written since becoming Muslim (www.sisteraishah.com), just to remind myself that I'm not really lost - I've just evolved; moving towards becoming whole. It is often difficult to focus on accentuating the positive and letting go of the pain - but, insha'Allah, I'll keep working on it. Jane's workout DVD, Jane Fonda Prime Time: Fit and Strong, comes out November 30. Preorder it now. Lovely post. I read her autobiography a few years back and found it to be masha'allah - very inspiring. Thank you for sharing.